The controller, based on the temperature, controls the ventilation and heating. Managing supply and exhaust ventilation, heating. All measurement data, settings and ventilation mode are displayed. Cyclic switching stages with minimal ventilation level. Stepping climate control, automatic and manual operation. Serial connection of exhaust fans when the temperature rises inside the building. Connecting the heater at low temperature inside the building. Digital temperature sensors - to 3 pcs. Exhaust and supply fans (4 groups). 4 relay outputs 220 V, 2 А. Unit Dimensions no more 130х110х40 mm. 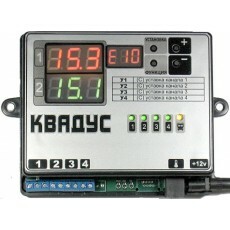 The ventilation controller "QUADUSE" 1 pc. Digital sensors indoor air temperature 3 pcs. Power adapter 220V/12V/1000mА 1 pc.